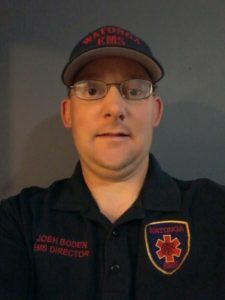 Watonga EMS is proud to recognize Josh Boden as a Star of Life. Josh, a Watonga native, is a very driven person, and is passionate about his role as Director of EMS. Following graduation from Watonga High School, Josh began his life of service by devoting five years to the Army, during which he attained the rank of Section Sergeant. Josh’s service included a deployment to Iraq during Operation Iraqi Freedom. When Watonga EMS was on the verge of closing its doors in early 2016, Josh played a significant role in reorganizing the service and mapping out a sustainable plan for its future. This was accomplished in a period of one month. Licenses were obtained, state inspections were successfully accomplished, and a third party billing company was contracted to address all of the issues on the billing side of the operation.